Israeli MPs have given preliminary backing to a controversial bill to legalise thousands of unauthorised Jewish homes in the West Bank. It applies to "outposts" - settlements built without official approval in the area occupied by Israel since 1967. The international community regards all settlements as illegal under international law, though Israel disputes this. 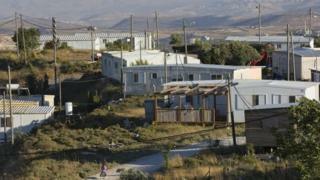 Palestinians see settlements as a major obstacle to a peace deal with Israel. They want all settlements and outposts to be removed from the West Bank and East Jerusalem, which they seek for a future Palestinian state. According to the anti-settlement movement Peace Now, there are 97 outposts, as well as more than 130 settlements in the West Bank and East Jerusalem. The bill, which would legitimise about 4,000 settler homes, still needs to pass three readings in Israel's parliament to become law. Its main backer, Education Minister Naftali Bennett, has called it the eventual start of Israel's annexation of most of the occupied territory. The move has drawn international criticism, including from the US, Israel's closest ally.